Do you remember when I posted the pictures from the photoshoot with Chanel, Jesse and I? (If not, be sure to take a look at the post!) 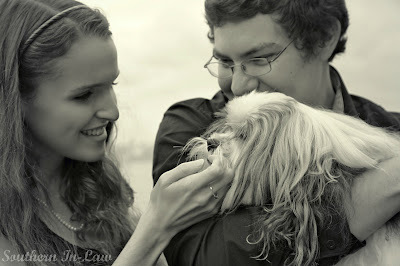 Well, those photos were taken by the lovely Katie Preston Toepfer - who is also the author of Wedding Dogs. I love the idea of Katie's book so much, that I wanted to share it with you - and ask her a few questions to really get to know Katie and the book. Wedding Dogs is a collection of photographs and stories of 70 couples who decided to incorporate their beloved pooches into their big day. From their dogs as the ring bearers, maid or honour, best man or just taking pride of place with the wedding party - the book is filled with pictures of cute canines in their doggy tuxedos or blinged out attire and tells the story good or bad of how the big day went. What gave you the idea to put together the Wedding Dogs book? I was looking through my parents wedding album and saw how they had their two dogs at the time (a Labrador and a Dalmatian) included in their wedding as best man and maid of honour. I knew that there had to be others out there that had done the same thing-and that's how Wedding Dogs was born! their Mum and Dad, Brian and Danielle. What is the one stand out story you found when writing the book? There are so many. One thing I loved was reading people's responses about why they chose to have their dog in their wedding. Many of them saw not including them as unthinkable. Their dogs are their family, so why wouldn't they include them. It's been so wonderful connecting with others across the world that love their dogs as much as I do! What about your own fur-babies? We have two Cavalier King Charles Spaniels. Violet and Mr.Darcy. They are our two fur babies and we love them very much. Working from home can often mean long hours with no one to talk to. But having the two of them by my side means I've always got company. They know as soon as the laptop lid shuts it's time for a walk so they use that sound as a cue to run to the door with their tails wagging! They love going for walks with us and especially love running on the sand at the beach. Violet and Mr.Darcy are both such laid back dogs and love lots of cuddles. Being cavaliers, they are big snorers but we are used to the chainsaw-like snoring now. Where are you planning on going from here? Are there other books or ideas in mind for the future? At the moment my main focus is on Wedding Dogs-the book and the website. I will start work on another book later in the year but it's top secret at the moment-stay tuned to Wedding Dogs to find out! Wedding Dogs is due for official release on April 16th, 2013 - however you can pre-order it on Amazon today! See more photos from our photoshoot with Chanel. So tell me, would you ever include your pets in your Wedding Day - or did you? Oh wow, what an innovative, creative and just plain damn cute idea! I don't have a dog, but as soon as I move out of uni accommodation I plan on bringing one home! It's definitely a cute book! 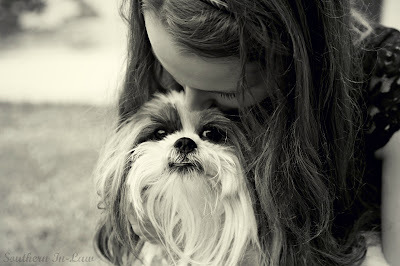 I adore my pups and I've thought about including Chanel in our wedding day - but I'm just not sure how! She's not trained (though we have tried, she's just a little bit of a princess!) so she'd likely end up running the wrong way or rolling on her back so someone could rub her tummy!